It used to be an article of faith that a solo effort by a drummer was, at best, a room-clearing affair. These days the tides, oh have they turned, with such fine examples as Frankie Rose, Sandra Vu, and a fella named Josh Tillman stepping out from behind the kit to lead. After stints in the Vivian Girls and Best Coast, it’s Ali Koehler making the jump to the bright lights at the front of stage, leading a new outfit called Upset. Upset came together this year, and the aces in Koehler’s deck are Jenn Prince (La Sera) and Patty Schemel (Hole). 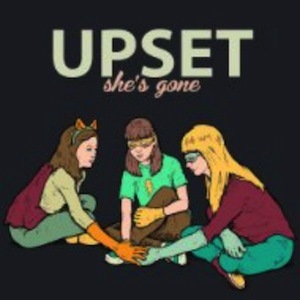 She’s Gone gets off to a rousing start with “Back To School” and the title track, before drawing the first emotional blood, the bittersweet gem “Oxfords And Wingtips.” Their whimsy shows at times, (“Don’t Lose Your Dinosaur”), over the varied platter, but the playing is never less than top flight. “Game Over” and “Never Wanna” bring back the wall-slamming energy; “Phone Calls” is another mid-tempo cruise with seething guitar. Like “Oxfords…,” it points away forward in future work to expand on their sound. Bottom line: this is an album of songs that begs to be heard live.